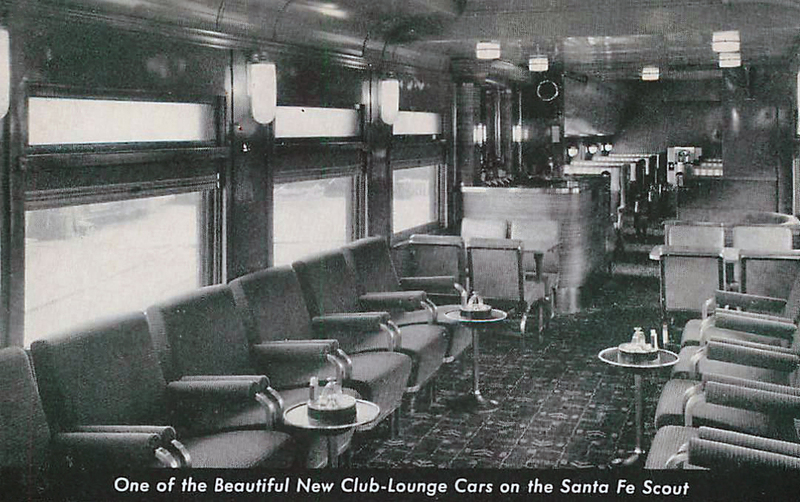 The lounge, also known as club cars, became a fixture of passenger trains following the dawn of the streamliner era in the 1930s. The car added to the comfort and luxury of rail travel by offering more amenities than a standard coach (such as a bar or snack counter yet without the full services of a diner) while still featuring plenty of relaxation (such as in later years when many lounge cars offered swiveled-chair seating), often with large windows for excellent panoramic views of the passing countryside (which was especially the case when domes were used as lounges). They were a popular service normally reserved for the flagship trains and as patronage declined one of the first cars pulled from consists. Today, Amtrak still uses the lounge car, as it has mostly supplanted diners since the carrier does not prepare on board meals and its trains only feature snack bars. 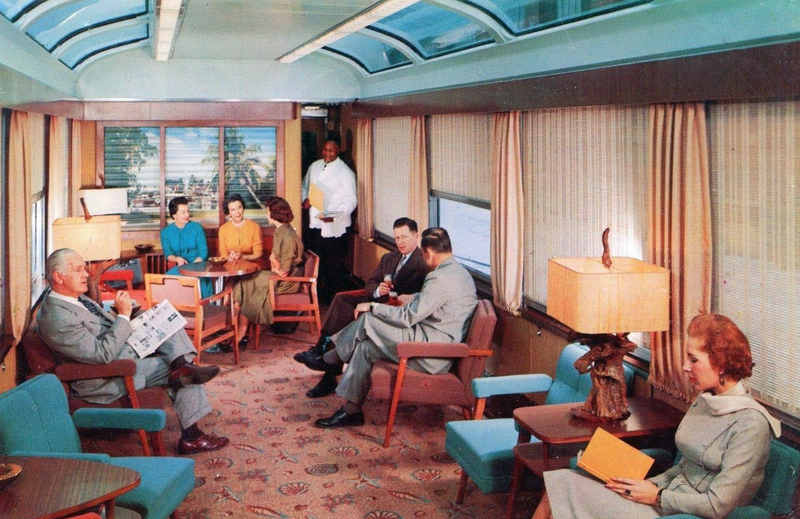 In a sense lounge cars featured the best of both the diner and coach. The standard coach car offered the most basic of amenities on board passenger trains, even during the streamliner era. Their purpose was quite straightforward, to provide basic [and in later years] and comfortable seating for passengers. Coach cars were the earliest passenger train cars, dating back to the late 1820s and 1830s and built to resemble stagecoaches of the day. In contrast, dining cars, or diners as they were also known, came into their own by the late 19th century. While this car was originally designed only to keep passengers happy during their long journey by train by the streamliner era some were serving dishes that would rival the best five-star restaurants from coast-to-coast. Dining aboard the named trains of the Baltimore & Ohio, Pennsylvania and Santa Fe railroads for instance became an experience into itself and many passengers rode their trains simply for the food! While Amtrak continued to serve prepared meals on board after its 1971 start-up, today that is no longer the case with the diner being replaced by snack cars and vending machines. While the lounge car was meant as a place for passengers to relax and enjoy the experience of traveling by train it also offered one the ability to enjoy a refreshment as well, particularly if they were not interested in sitting down to a full course meal in the dining car. 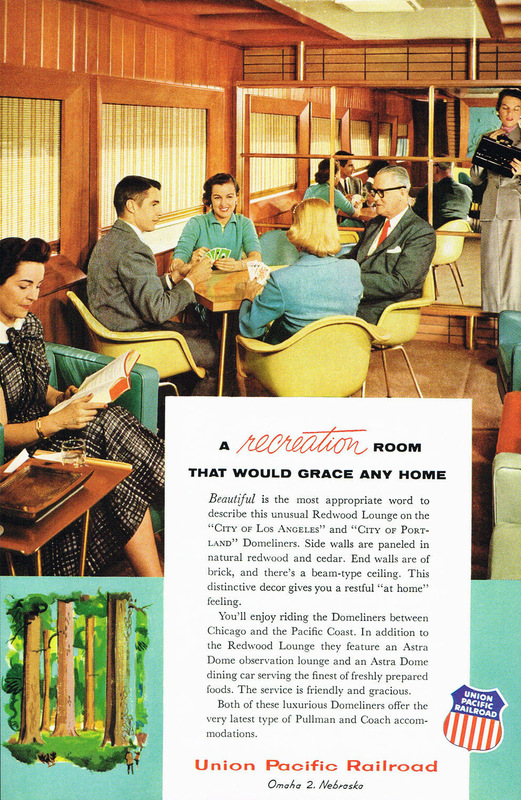 With the arrival of dome cars in the 1940s railroads further heightened the experience of the lounge car (typically domes were used in a wide range of layouts from lounges to diners). One notable difference between the lounge services offered by Amtrak and those during the streamliner era was the food itself. Whereas today Amtrak offers only prepackaged snacks today, years ago one could get actual prepared food from the snack/club bar it was only that the train offered a more limited menu than what would be featured aboard the dining car. Even homemade sandwiches could be ordered from the bar in those days. While a train's dining services usually always featured the best and most delicious food it had to offer several are fondly remembered for their lounge services. These include the Milwaukee Road's "Tap-Grill" offered aboard its Olympian Hiawatha, the Santa Fe's Super Chief lounge services, and the Northern Pacific's Traveller's Rest buffet-lounge featured aboard its signature train, the North Coast Limited. Technically lounge cars could only hold a distinction of being such if they offered some type of both drink and food services. 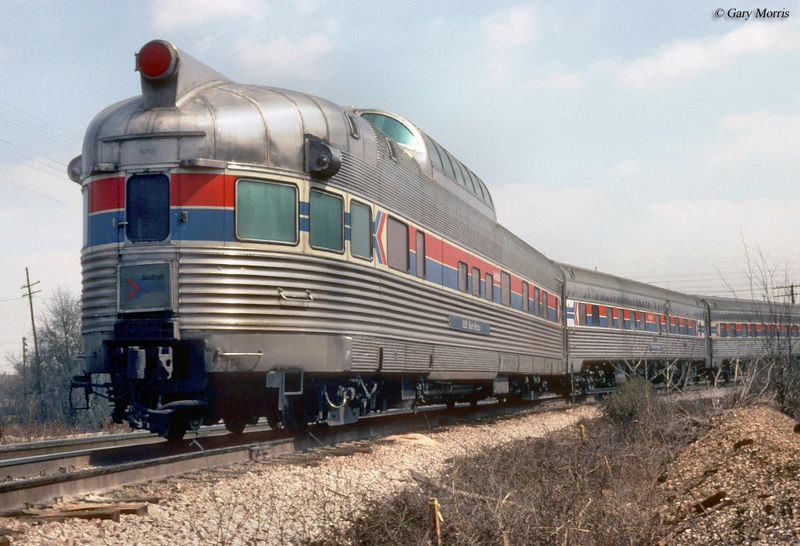 It should be noted that not all passenger trains offered buffet lounge services and sometimes when available it supplanted dining services (these were typically found on regional runs like the Chicago & North Western Railway's fleet of 400s and the Milwaukee Road's Hiawathas). Likewise, full service dining was almost exclusive to long-distance passenger trains that traveled more than a day to reach their destination as a lounge car would suffice for trips shorter than this. Today, Amtrak still feature lounge cars aboard their trains although the services provided a far cry from that of the streamliner era and when the private sector operated passenger trains. Still, some of the many tourist railroads around the country offer lounge services if you would to experience what it was like to travel board this car in years past. Some of the more well known such railroads offering these services include the Grand Canyon Railway and Napa Valley Wine Train. For more reading about lounge cars the book American Passenger Train Equipment: 1940s-1980s by author Patrick Dorin provides a very nice general history of classic car types used in service (predominantly during the streamlined era) featuring many drawings and detailed information on several. Also, the book The Cars of Pullman from author Joe Welsh, Bill Howes, and Kevin Holland. As the title implies the book details and highlights the various types of cars Pullman built throughout the years, along with giving a general history of the company in the process.